Resorts of the Mediterranean Sea give a great opportunity for relaxation. 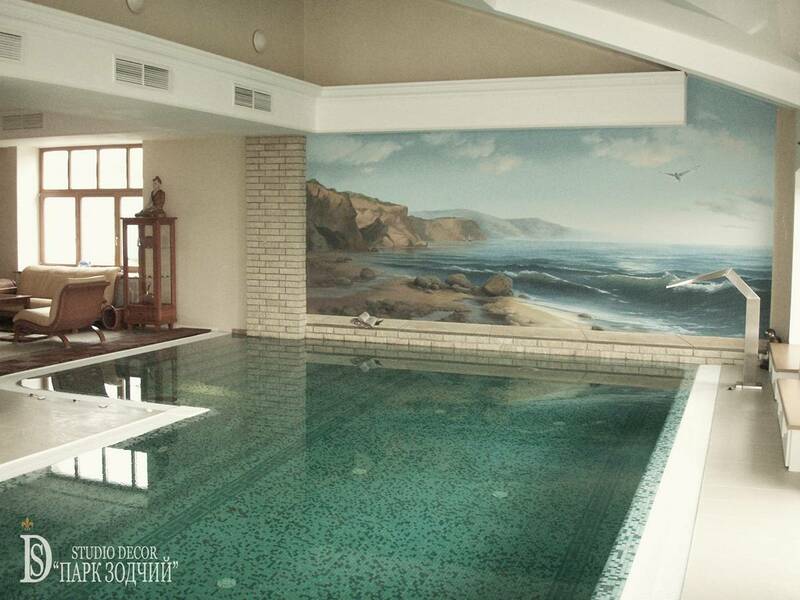 Based on this, the painting of the swimming pool, light sand tones, azure color have been chosen for decoration of the swimming pool, and have become the basic for creating the Interior design. Due to this, the house has acquired a wonderful area for water procedures combined with the relaxation area. Let's take a look at the features of decoration? The designers have taken the advantage of space, in which the area for relaxation, active recreation and recuperation has been organized. In fact, it consists of two parts, conditionally separated by the swimming pool nosing. Therefore, it is easy to come from the chair directly into the swimming pool via the convenient steps. The column and part of the wall are made of decorative, as if bleached by the sun and hot wind, stone. Large windows create the additional illusion of open space and give the room a lot of light. The shower of unusual form for hydro-massage serves to stimulate the body internal reserves and gives freshness. Trompe l'oeil painting on the wall is so realistic that you could imagine the sound of the surf, feel the sea breeze on your skin. Windows located on the opposite walls illuminate the relaxation area and the swimming pool at different times of day, “remove” barriers between the room and outside world. Spotlights are located alongside the perimeter of the swimming pool. Remarkable lighting in the evenings creates a special intimate atmosphere and contributes to enjoying the water procedures. It was written much about blue color. Properties of its exposure to the human are not explored until the end, but if you want to relieve mental stress, to have a good rest, you cannot do without it anyway. That is why the Interior contains many different shades of that color. Mosaic imitates the seafloor, and horizontal stripes define the geometry of the swimming pool and follow the contours of the ceiling. 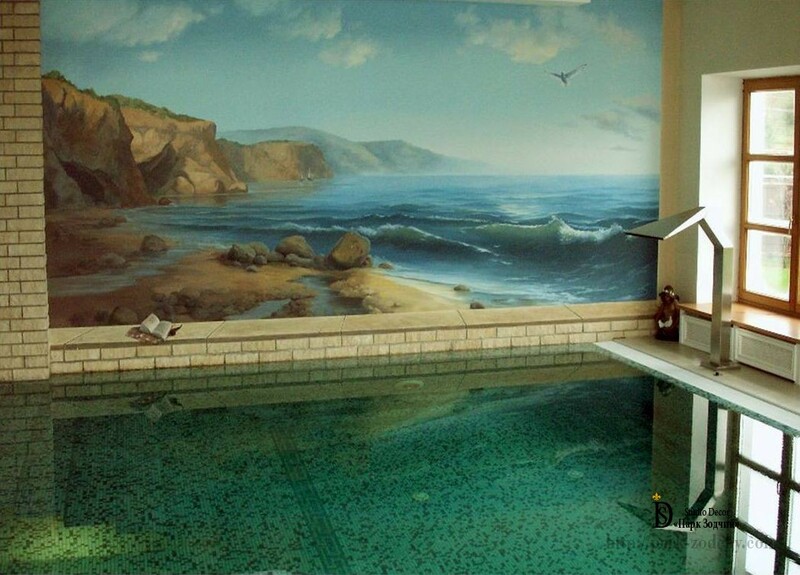 In addition, the room is penetrated by sunshine; while getting on the water surface, it creates an unusual effect of natural sea lagoon, which seems to be a continuation of the wall painting, that helps to “find themselves” imaginatively on the shore of the Mediterranean Sea, surrounded by waves, sea gulls and coastal cliffs. The advantage of the ceiling form is taken in an interesting way via two colors: white and beige, they harmonize with tones of painting on the wall, color of furniture and tiles in the relaxation area. All this has allowed creation of light flexible space, flowing from one to the other, able to give special rest, return balance of mind and restore the physical balance.